Weekend style is always a bit tough for me and usually these three questions go through my head... How dressy do I have to get for brunch? Should I wear heels or flats if I know I'll be walking a ton? Should I bring my giant tote with me or is a smaller bag all I need? After I answer these questions - sometimes out loud to Gary, but usually it's an internal dialogue, I come up with a casual, but still dressy enough outfit, like the one I'm sharing today! I posted a sneak peek of this outfit on Instagram, but wanted to go into a bit more detail since everything I'm wearing is ridiculously comfortable and perfect as the weather starts to heat up! Apologies that these photos are a tad bit grainy and not as sharp as I'd like them to be - I wasn't anticipating taking outfit photos, but when the mood strikes, the iPhone will have to do! Does this door look familiar? We took our engagement photos here & it also happens to be what I use for my blog button! Remember when I was on the hunt for a chambray shirt for close to a year, well since it's been found I haven't been able to stop wearing it! It makes me happy when pieces like the shirt can be worn to work and on the weekends - double duty! Cloth & Stone sold at Anthropogie is the brand, but they aren't making this exact style anymore, however it's the softest chambray I've ever felt but I think that also means it wrinkles more than I'd like! I think that's just the price you pay with wearing this type of fabric. Another outfit piece I haven't been able to stop wearing are these white jeans I scooped up from Loft a few weeks ago! To say the fit is amazing would be an understatement! They are more relaxed so you don't feel like you're suffocating and the best part is that with these white jeans you won't be worried about those little imperfections that you can see in white denim - I think you know what I'm talking about! Finally, my favorite new bag - the Mini MAB from Rebecca Minkoff! I talked about it when ShopBop was having their sale and that's when I picked it up! The pink is the perfect pop of color for this time of year and while the bag is pretty small, I'm able to fit everything I need for a day out - phone, keys, wallet (I use my card case from this post) lip sticks & charger. My shoulders thank me on the weekends for not lugging a too heavy tote with me! I just know that pieces of this outfit are going to be worn over and over again as we keep getting into the warmer months - AND I'm totally okay with that! What is your go to weekend outfit? What do you like to pair your white jeans with? Loving the pop of pink with this adorable outfit! I love the color of your purse! Just so fun! My chambray top is a staple on the weekends, too. It's just so comfy. There's my favorite model looking all Springy and Sensational!!! Chambray suits you so well and of course so does PINK!! Love that bag and your espadrilles are darling and I bet comfy!! Pretty as can be!! Love load love chambray and you make it look even better with those white jeans and pop of pink. Great bag-- love the look! such a cute and classic outfit. It's so great when you find the perfect pair of white jeans! The pop of pink is perfect! Love the color combo--I'm a HUGE chambray fan and I think the pop of pink is perfect!! Love the chambray ! You always look so put together ! XoxO Happy Tuesday ! I have two Cloth and Stone chambray shirts from Anthro and they are the best!! So soft and will last me years!! I know you love yours too! I'm looking for a great chambray shirt too!mand a dress. Cute look! Love this easy weekend look! Totally agree, Cloth & Stone tops are so soft! Very cute! I love preppy, simple looks like this...esp with a pop of pink color! This exact outfit has been on repeat for me too!! So easy yet looks so put together! 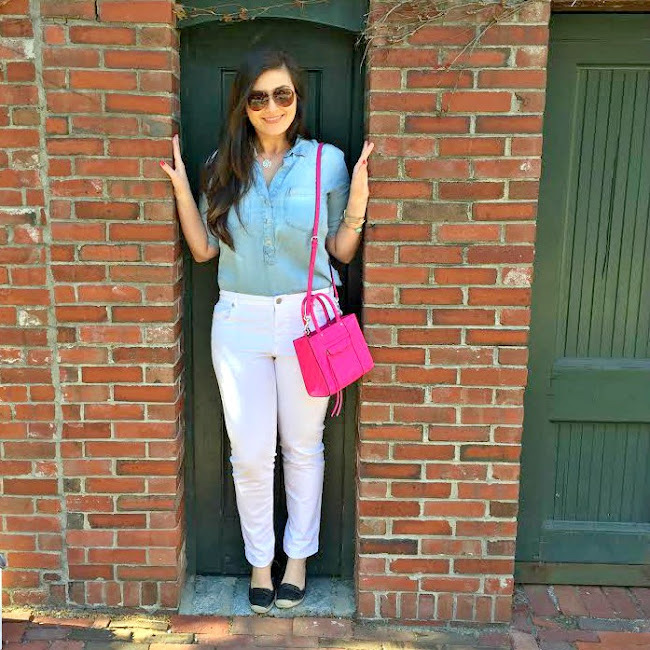 I love that you paired that bright pink purse with your chambray and cute white pants! It's the perfect pop of colour! That pink purse is just too cute and the perfect pop of color to this outfit! Love it! I love my chambray shirt!! Wear it with leggings and boots in the winter and white shorts/pants in the spring + summer. Chambray shirt + white jeans = one of my very favorite outfits ever. It's so easy to throw on a statement necklace to dress it up, too! cute and classic!!! that bag--NEED that in my life. so dang cute! ha i almost wore something just like this today! i mean it's such a classic look that you can even play up for nighttime. you look so pretty! and that bag - i mean hello gorgeous! 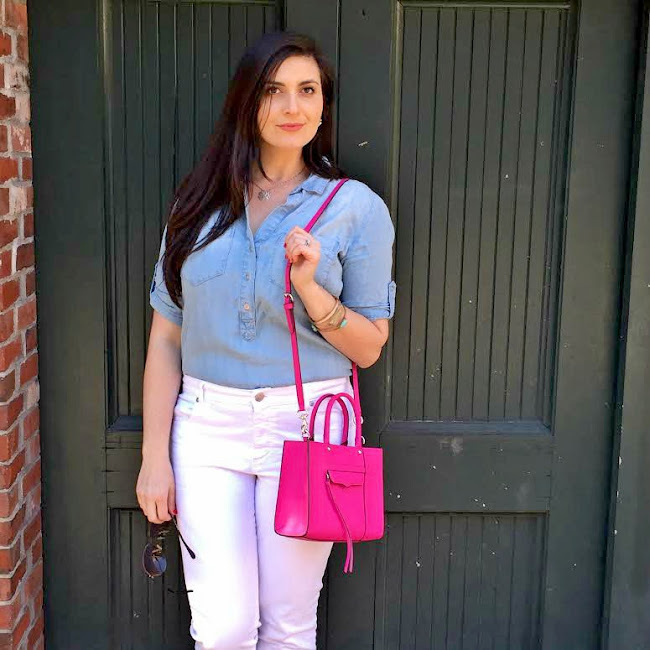 Huge denim on denim fan and I love the pop of pink from the bag! Looking pretty as always Biana! Your hair is gorgeous! Yes! You already know that I love me some chambray and white! Love how you added the pop up hot pink! So pretty! A good quality chambray top is seriously one of my most versatile pieces in my closet. So many uses for it! Chambray is becoming one of my favorite fabrics to wear! 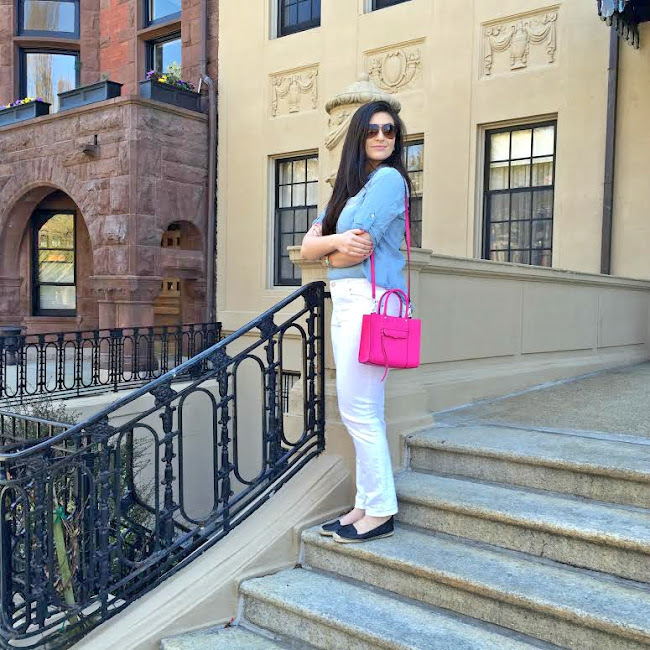 I love the way you paired it with your white jeans and how your bag gives everything an extra pop of color! That looks like the perfect and most comfortable brunching outfit! You need to go back & take your picture in that door frame every year :) Wouldnt that be cool to look through the years. I am STILLLLLL on the hunt for good white pants. The struggle is so real! The mix of chambray and white is so perfect -- it's one of my go-to combinations, too! Love the pop of color with your RM bag. You look fabulous, Biana! I love everything about this outfit, Biana! The chambray looks so soft and comfortable and pairs perfectly with the white denim; I'll have to check out Loft because I, too, have been experiencing some difficulty looking for that perfect pair of denim that doesn't show everything! I also love that Rebecca Minkoff purse, the color is indeed perfect for spring and I love it with this outfit, you look fab, girlie! Thanks so much for sharing and I hope you have the most amazing day! I'm loving this! The mix of chambray and white has always been a favorite of mine. I need a good pair of white jeans now...totally adding it to my shopping list! Love your bag, it's so adorable! And the shoes...LOVE! This is the definition of the perfect weekend outfit. I agree that it can be hard trying to figure out what to wear. You don't want to look to casual, or too dressy - the struggle! I also have a cloth & stone chambray shirt from Anthro and I love it. That bag is the perfect pop of pink too, so cute! love this outfit!! white jeans are definitely my go-to for summer, and a chambray shirt is the perfect touch. I think it's a perfect brunch outfit :) and that purse is the perfect color pop, too!! Definitely still into chambray- it's such an easy + versatile fabric to wear! Love this fresh look! This was my go to look last summer and I'm sure it will be again this summer. Still love that top! Love this outfit, so classy!! I always ask myself similar questions. Or if it is the dead of an Alabama summer I will ask myself if I need to wear something that doesn't show sweat. Hahaha. I adore the look of chambray and white- such a classic spring staple! This outfit is perfect! 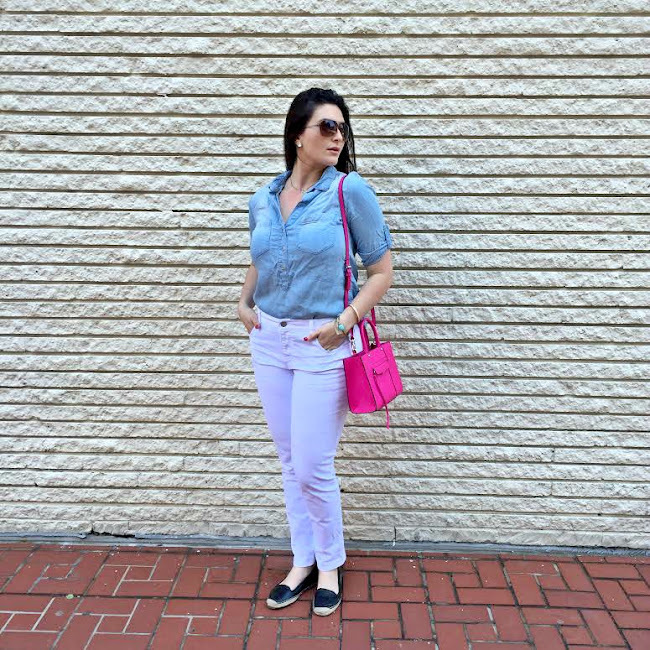 I always love chambray and white pants together, and the pop of pink from the purse gives it such a fun vibe. 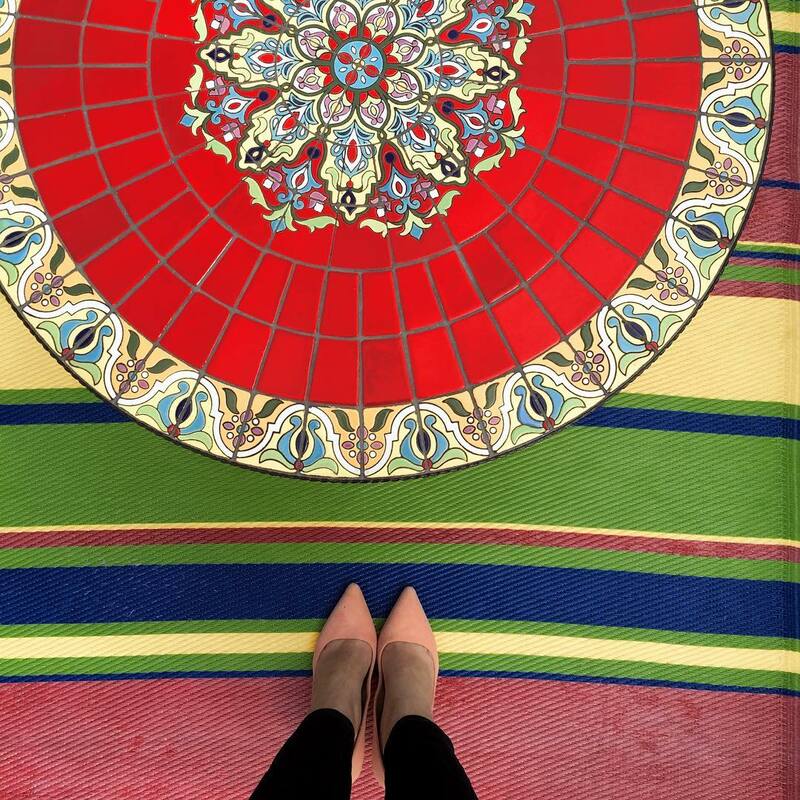 Love this look, Biana! I've been WEARING OUT white jeans this spring, and I would love to have a chambray top to pair with them. So classic! Cute! Perfect weekend outfit. Love the pop of pink and I swear by Loft's jeans. They are THE most comfortable ones I've found! I love the look! I have the same bag in neon yellow - so I might re-create the same look but with yellow. I love the pink one though. 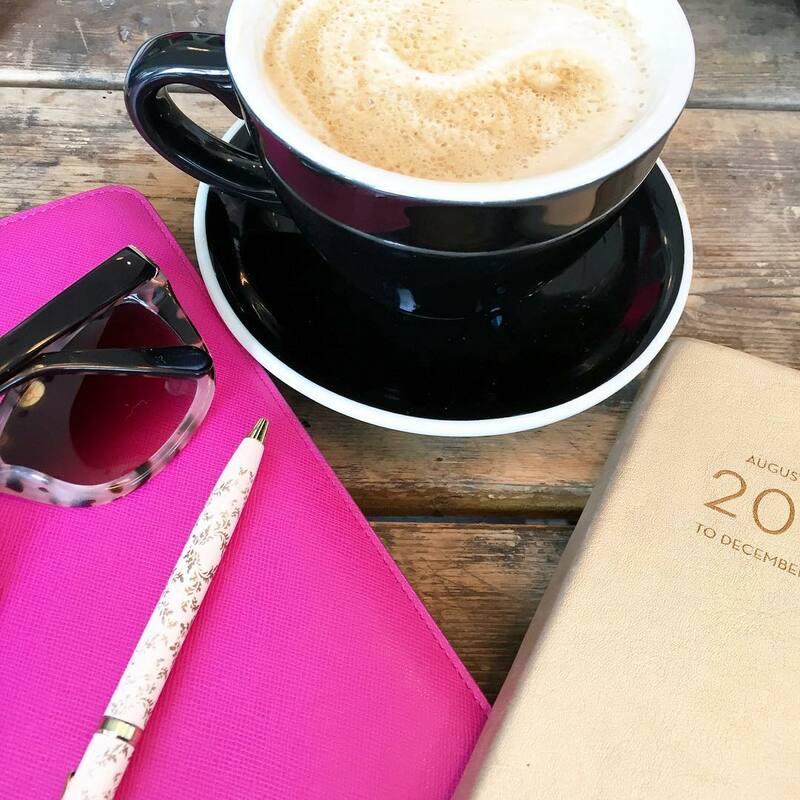 weekend style can be super hard especially if you are doing tons of different things, plus walking. this is a super cute outfit though, white jeans look fabulous on you! that bag is adorable. I'm on a perpetual hunt for chambray shorts I like, to wear with a crisp white shirt so this in reverse is on my wish list! So perfect for the summer!! You look adorable! Love the pop of pink with the chambray and white! This is classic! This is so versatile; it'd look just as fabulous with leopard heels for a night out! Cute, cute, cute!! I love the espadrilles with this. This is pretty much my uniform in this time of year! And I love that bright pink bag! I agree about weekend day wear! Night is easy to figure out but the day (when it includes walking a ton too!) is different. I think this look is GREAT on you. Very casual yet super chic and clearly the shoes lend themselves well to exploring! Love it. I love the pop of pink from the purse! I may have to copy this outfit for Sunday Funday! Love this girl.. I totally have all these similar pieces, so I need to put this outfit together like you did. That bag is so cute, perfect size for the weekends when you don't want to lug everything with you in a heavy tote. Also how cute is that pic with the door, looks just like your blog button! Loft has the best jeans! 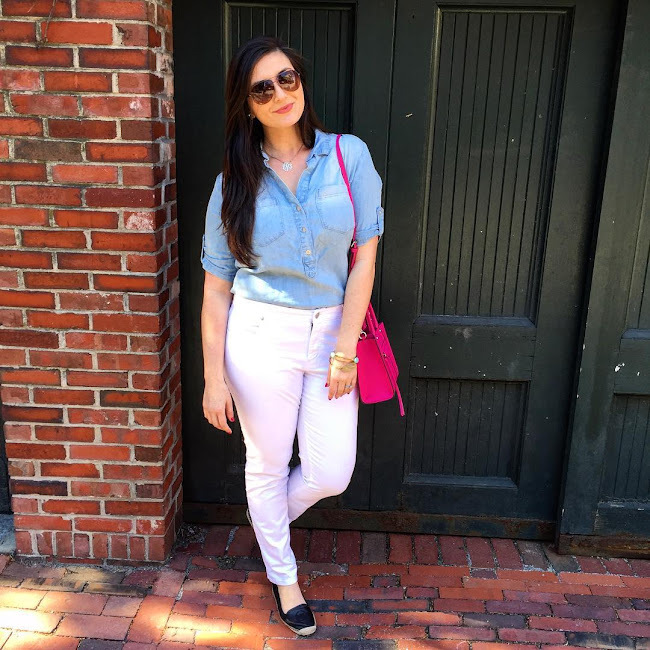 I wear my chambray shirt all of the time and love it styled with the white jeans! 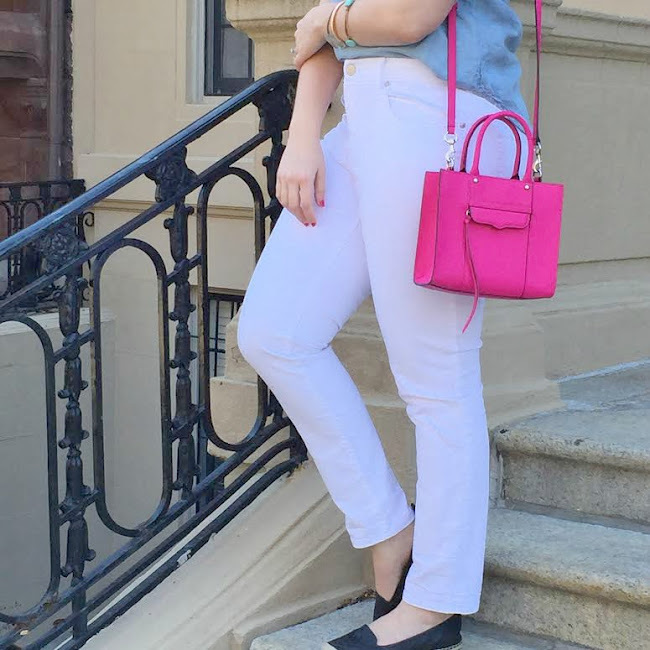 Such a classic look and your pink bag is the perfect splash of color! Love this look - my friend showed up at our house this weekend in the same look and I was so inspired to recreate it! Love how you took that picture in front of the same door you used for your engagement pictures. Sentamentality yes! I love your entire look! Perfect for a cooler summer day or spring. It's way too hot down here for me to fathom wearing pants, but definitely on one of our cooler days this is a must! I LOVE that door and I LOVE your outfit! And I pretty much ask myself those same 3 questions before heading out on the weekends too! Anddd typically end up wearing something similar to what you're wearing in these pics! White and chambray plus a pop of pink = perfection!! You have perfected the denim-on-denim look once again. I just recently purchased a new chambray shirt as I needed one so I need to get that out. I always love the look of a chambray shirt with white denim. That Rebecca Minkoff bag might have to be mine as a little splurge for my birthday. And your shoes are so cute B. Would love for you to link up with me today with this lovely denim outfit. Thanks babe. This is so perfect-- especially with the pop of pink! Love this look! Perfectly classic. The bag is the absolute perfect pop! I love this look. I need to find a pair of white jeans that I actually like and wear this combo. A chambray shirt is always a perfect piece for the weekend!